The “double chin” is an area that is very discouraging for many people. Often it seems that no matter how much you diet or exercise, that stubborn submental fullness is still there. Kybella is now available, which is the first injection of its kind to treat the double chin right in the office without surgery. The active ingredient in Kybella is deoxycholic acid, which is a chemical that naturally degrades fat. The ideal patient for Kybella is someone who has fat in the submental area. It is important to differentiate this from loose skin or hanging platysma muscle bands because different procedures are needed for those conditions. The submental fullness may result from weight gain, aging, genetics or other reasons. Where will my Kybella procedure take place? All our cosmetic treatments are performed at our immaculate, accredited outpatient medical centers in New Jersey. These state-of-the-art facilities offer the same impeccable safety record as any reputable hospital; however, we have created an environment where discretion, comfort, convenience and personalized attention are the norm rather than the exception. 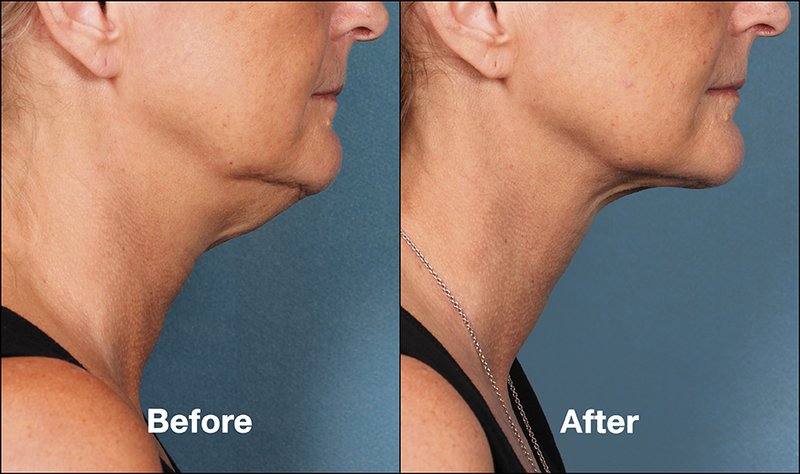 Kybella is a simple in-office procedure that takes 10-15 minutes. After placing some numbing cream, the solution is injected directly into the fat in a spread out fashion under the chin. For the next few days some bruising or swelling is expected, then the fat will reduce over the next month. Usually 2-4 treatments are needed for best results. No matter how much this patient dieted and exercised, he could not lose the fat under his chin. Kybella treatments were given 4 times and now he is extremely happy with his submental area. This patient did not like taking photos from the side because of her heavy chin and did not want surgery. After 3 sessions of Kybella, her submental fullness is much better and she happily takes pictures from the side now. 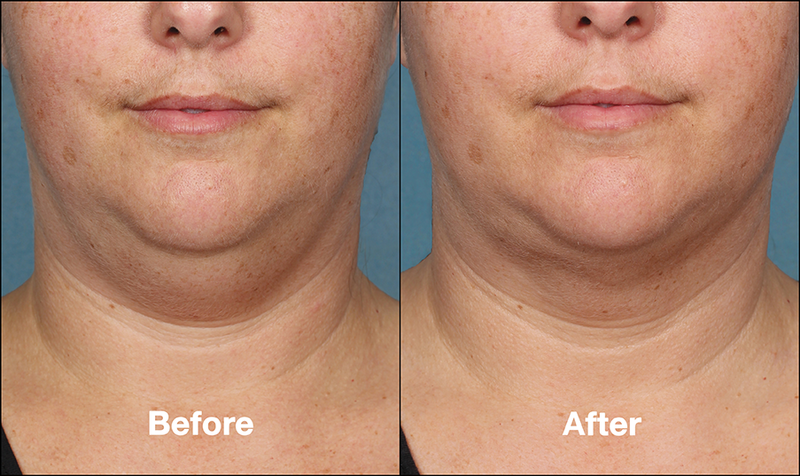 While these results are great, Kybella is not for everyone. People that have really loose skin or muscle bands may need other treatments such as Ultherapy or surgery. Your plastic surgeon can discuss those options with you at consultation as well. But for the issue of submental fullness, Kybella is an effective and proven treatment. If you would like to speak with an experienced plastic surgeon in New Jersey about Kybella, please call 732-548-3200 or contact us online to arrange a consultation.